In his July 1986 Presidential Address to the Western Economic Association, Allan Meltzer noted that “the tradition in which many of us were raised is that policymakers should adjust policy actions based on forecasts of the future path of the economy and their best judgments.” Meltzer went on to show that Federal Reserve staff forecasts on economic performance were often so imprecise that predictions just one quarter into the future could not distinguish statistically between the likelihood of strong economic performance or a recession. But perhaps because they see no better alternative or perhaps just because, as Meltzer also noted, “traditions die slowly,” the Fed’s policymaking Federal Open Market Committee (FOMC) continues to use some, not fully specified, mix of forecasts and judgments to set its target for the federal funds rate today. In a new working paper, we take a closer look at the Fed’s official “Greenbook” forecasts, to compare their role, relative to FOMC members’ own judgments, in the policymaking process. We find that deviations of the actual funds rate from a monetary policy rule based on Greenbook forecasts display a consistent cyclical pattern: too high before business cycle peaks and too low after business cycle troughs. These results suggest that so long as the FOMC continues in its long tradition of using some combination of forecasts and judgment in setting the funds rate, its stabilization objectives would be better achieved by placing more weight on evolving forecasts and correspondingly less weight on judgmental deviations from a forecast-based policy rule. The Federal Reserve’s Greenbook forecasts for the output gap and inflation are recorded in a data set maintained by the Federal Reserve Bank of Philadelphia. 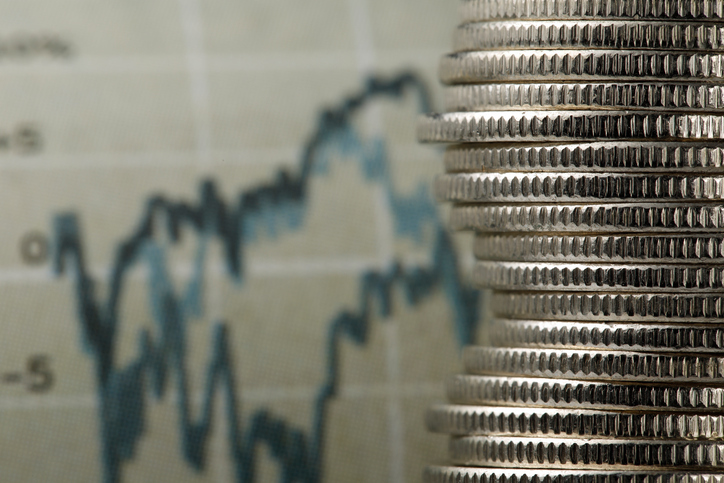 These forecasts are produced by the research staff at the Federal Reserve Board and presented to the FOMC for consideration when decisions are made about setting a target for the funds rate. Here, the data begin in 1987:3, the first date for which forecasts of the output gap are available, and end in 2012:4, because of the five-year embargo on the release of Greenbook forecasts. To help interpret these Greenbook forecasts and their implications for setting the funds rate, we feed them through the monetary policy rule first proposed in a 1993 article by John Taylor. Our version of the Rule – with a two percent inflation target, a two percent real interest rate, and weights of 1.5 and 0.5, respectively, on deviations of inflation from target and the output gap – coincides exactly with Taylor’s, except that we use one-year-ahead Greenbook forecasts to measure inflation and the output gap. Thus, our analysis recognizes the forward-looking nature of policy decisions made today in an attempt to influence future economic activity. Moreover, as noted in a recent paper by Alex Nikolsko-Rzhevskyy and David Papell, this version of Taylor Rule does not call for deeply negative nominal interest rates during or after the financial crisis, unlike others that place larger weights on the output gap; it also is the version of the Rule preferred strongly by John Taylor himself. The first graph below plots the prescriptions of the forecast-based Taylor and shows the actual funds rate tracks the same general pattern; indeed, the actual funds rate appears to move systematically towards the value implied by the Taylor Rule. Together, these observations suggest that Greenbook forecasts are important inputs to the FOMC’s policy decisions and appear to be used in a policy framework that shares the same spirit of the Taylor Rule. Differences between the two series illustrated in the second graph, however, highlight features masked by their shared broad movements. In fact, the deviations display a distinct cyclical pattern. Extended periods during which the FOMC held the funds rate below the level prescribed by the Taylor Rule appear after each of the three recessions of 1990-1991, 2001, and 2007-2009. Even more striking, each of these three recessions is preceded by settings for the funds rate that are substantially above those implied by the Greenbook forecast-based Taylor Rule. 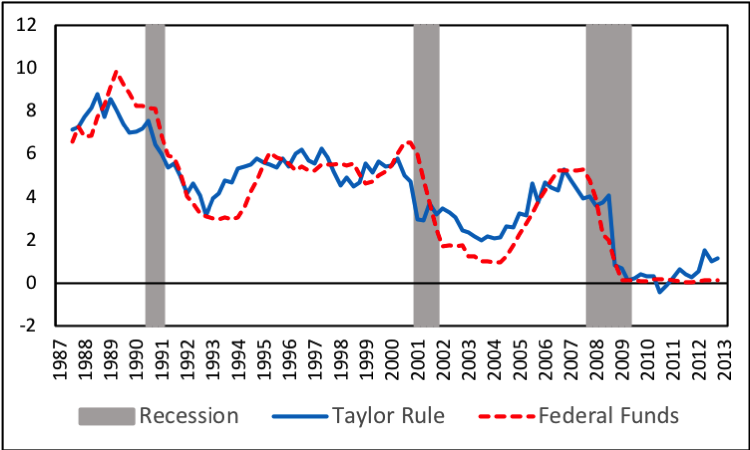 The reason the values for the two series diverge so sharply can be seen by looking back at the first graph, where the funds rate under the Taylor Rule begins to decline several quarters before each business cycle peak. 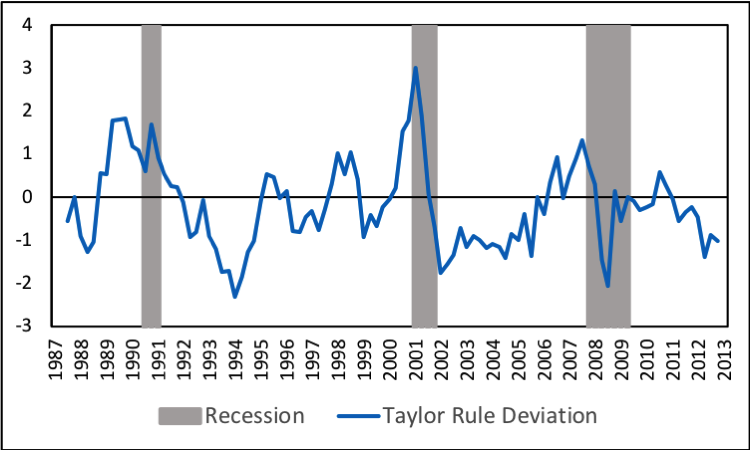 If deviations from the Taylor Rule are interpreted as periods where the FOMC emphasized discretionary judgments to determine the most appropriate stance of monetary policy, these observations suggest that judgmental deviations have tended to amplify, rather than stabilize, cyclical fluctuations. And to the extent that policy decisions made under discretion are destabilizing, it appears as if the FOMC might be better-served by responding to signals of emerging macroeconomic strength and weakness embodied in Greenbook forecasts within the context of a policymaking strategy that adheres more closely to the Taylor Rule. Michael Belongia is a professor of economics at the University of Mississippi. Peter Ireland is a professor of economics at Boston College and a member of E21's Shadow Open Market Committee.